Quality education is necessary for a successful life. What we become in the future, greatly depends on the quality of education we receive. But it is also a fact that the cost of education at top institutions/universities in India and overseas has been increasing over the time. Due to this, and also students’ firm determination to achieve their dreams, Education Loan is proving to be a boon to the students and parents. Education loan is availed to finance all your education related expenses. It is given for the purpose of pursuing an academic degree in India or abroad and is provided by almost all banks and NBFCs (Non-Banking Financial Companies). An education loan covers all expenses including course fees and other associated expenses like living charges, books and supplies, exam and other miscellaneous charges. Education loan can be availed for a full-time, part-time, graduation, post-graduation, vocational, professional and technical courses conducted by institutions and universities affiliated or accredited by the competent authority in India or abroad. It is easier to get an education loan for technical courses than non-technical courses because the lending institutions consider the risk of defaults and job assurance in case of non-technical courses. The loan amount varies from bank to bank, usually upto Rs. 15 lacs is sanctioned for studies in India and Rs. 20 lacs or more for studies abroad. It is lender’s discretion to sanction the loan amount and depends on internal policies of financial institutions. There are two types of education loan – secured and unsecured. A secured education loan is one against which you provide a security or collateral and in an unsecured education loan there is no need to provide any security. Usually, upto Rs.4 lacs of an education loan, no collateral is required but when the loan amount exceeds Rs.4 lacs, borrowers are required to provide collateral/security and a third party guarantee to secure the loan. In very rare cases, when the student is extraordinary or highly meritorious and has secured admission in one of the Ivy League colleges in India or abroad, banks & NBFCs provide a larger education loan without any collateral. However, there are some banks and NBFCs in India that provide education loan without collateral in normal course as well. Any Indian student, who has got an admission into a university/college approved by any competent authority in India or abroad, is eligible for an education loan. There is no restriction on the upper age limit as per the RBI guidelines. Students are required to submit additional documents such as letter of admission from the institution, class X, XII and graduation (if done) mark sheets, the break-up of the costs of the course, visa documents etc. As the students don’t have the credit history, income and asset details of the co-applicant, in most cases of parents, are also required. The interest rate varies from bank to bank. Generally, it ranges from 9% to 13.5%, depending on the bank, loan amount and the college/university. The borrowers have the choice to choose from floating interest rate or fixed interest rate. Students can claim tax benefits provided by the government of India on the interest rate paid. It is advisable to check with your bank about the latest interest rate. 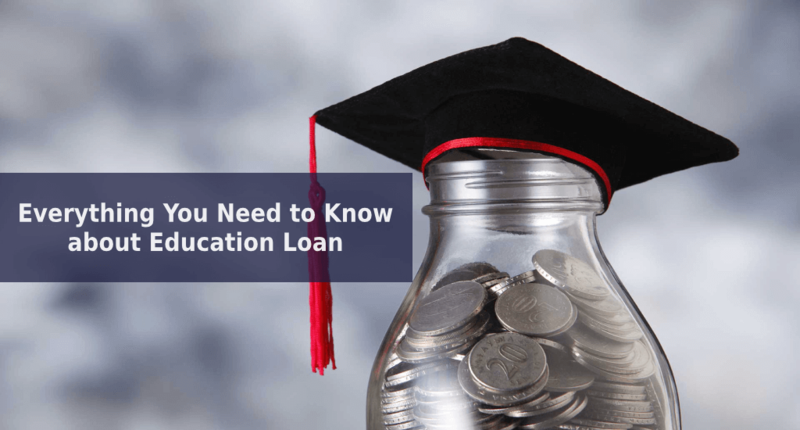 The tenure of education loan usually ranges from 5 to 7 years after the commencement of repayment, and can be extended beyond that, depending on bank’s guidelines. Punjab National Bank, for instance, issues education loan that can be repaid within 10 years. If the loan amount exceeds Rs.7.5 lacs, the repayment period may be extended upto 15 years too. Additionally, some banks provide an additional moratorium period of 6 months to 1 year after the completion of the course. This helps the student in getting time to hunt for a job post course completion. While applying for an education loan, you should also consider and compare the bank charges associated with processing, pre-payment, late payment of EMI etc. However, the processing fee applicable on education loan is much cheaper than that applicable on personal loan. You are entitled to claim tax deduction on the interest paid on education loan, in compliance with Section 80E of the Income Tax Act. You can avail tax benefits once you start making repayment of your education loan. Students are supposed to submit bills as proof to claim tax benefits. Remember the tax benefits can be availed for a period of 8 years, thus if your loan continues after this period, no tax benefits will be granted. Taking education loan provides you the first exposure to the world of credit. You can learn to build the good credit score if you repay the loan in time. Your good credit history will help you get other loans – car loan, home loan, personal loan etc. Financial pressure should not constrain students from accessing quality education. With a great number of options from banks and NBFC, you can help yourself or your child realize the dream.